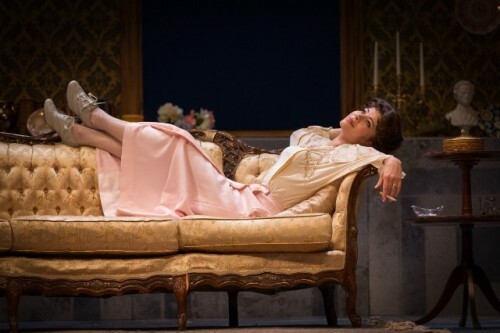 Susanna (Inna Dukach) relaxing with a cigarette in Ermanno Wolf-Ferrari's hilarious "Il segreto di Susanna" (Susanna's Secret), a production of Boston's new opera company Odyssey Opera. Eve Gigliotti as the troubadour Zanetto and Eleni Calenos as the courtesan Silvia in Pietro Mascagni's late 19th century fever-dream "Zanetto," which shares the bill with "Il segreto di Susanna." 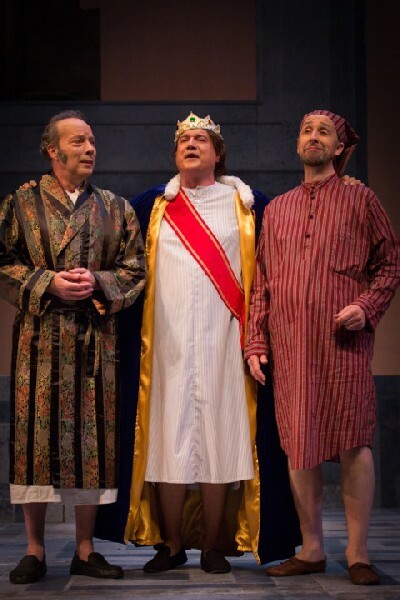 Three baritones: James Maddalena as the Barone di Kelbar, Michael Chioldi as the Cavaliere di Belfiore (in disguise as the King of Poland) and David Kravitz as La Rocca - all singing at breakfast - in Verdi's first comedy "Un giorno di regno" (King for a Day). The pair of young sweethearts in "Un giorno di regno": Jessica Medoff as Giulietta and Yegishe Manucharyan as Edoardo. In recent seasons, in Boston as well as across the country, we’ve gotten used to reading about the death of performing arts organizations, the most grievous loss being the New York City Opera, long the nation’s fourth major opera company, which was noted for adventurous programming along with incompetent management. For one to be born is a rarity. So it was with a mixture of hopefulness and fear that I attended Odyssey Opera’s first season of staged operas. (It had launched itself last fall with a concert version of Wagner’s early and seldom-heard “Rienzi,” which was well performed but dramatically inert, as concert operas tend to be.) Perhaps to acknowledge the rarity of its birth, Odyssey, which is dedicated to taking its audience on a “journey through the lesser known reaches of the opera world,” in the words of its artistic director Gil Rose, programmed three operatic rarities from the often ill-served Italian repertory: “Un giorno di regno” (King for a Day), a comedy by Giuseppe Verdi, which was judged a failure at its premiere; and, in its second program, a lyrical one-acter from the feverish late 19th century by Pietro Mascagni, which was paired with Ermanno Wolf-Ferrrari’s “Il segreto di Susanna” (Susanna’s Secret), a one-act comedy from the time just before World War I. On paper, it was an enticing idea. I could hardly wait. And in execution, it turned out to be a promising start of what one hopes is a long-lived local company. The two comedies were effervescent and elicited real laughter from the audience, and if Mascagni’s romantic idyll was something of a dud, at least we got to hear it. And I’m sure that no more than a handful of audience members had before. Indeed, I doubt if more than a handful of audience members had ever heard of it before. Very quickly my initial fears gave way to pure enjoyment. A new opera company was born! And for Boston’s small but devoted opera audience that is a true reason for celebration. Verdi’s “Un giorno di regno” is hardly a masterpiece. It comes across like a lesser comedy by Donizetti, who was still alive and active when the young Verdi premiered his first comedy, his second opera, in 1840 at La Scala in Milan. Indeed, one of Donizetti’s most delightful comedies, “Don Pasquale,” was first produced three years later, in Paris. After its failure – it closed after one performance - Verdi retired to lick his wounds, not writing another comedy until more than 50 years later when he came out of retirement to compose “Falstaff,” a work many consider the greatest comedy in all Italian opera as well as Verdi’s crowning masterpiece. Donizetti was equally comfortable composing both comedies and tragedies throughout his career. Although many of Donizetti’s works languish, there’s nothing wrong with producing one of his second-rate comedies, even if it were composed by Verdi - maybe especially if it were composed by Verdi. It suggests what the career of the opera composer who dominated the second half of the 19th century might have been - equally devoted to comedy and tragedy - if that fickle La Scala audience had been more discerning. In any case, after more than a century of being ignored – it is Verdi’s least performed opera – “Un giorno di regno” is finding new audiences. There was a starry production in Parma in 2010 and it was done last season at Glimmerglass in Cooperstown, New York. You can see why: “Un giorno di regno” is funny. And it shows hints of the Verdi that was to come. The typically ridiculous plot is lightly handled, and it provides opportunities for two old fools, the Barone di Kelbar, who wants to marry off his daughter against her wishes to the wealthy Treasurer, La Rocca, to be shown up. (Not unlike Don Pasquale in the Donizetti classic.) And it allows for all kinds of confusion when the Cavaliere di Belfiore, pretending to be the King of Poland – the real king is slowly making his way across Europe in disguise to be crowned in Warsaw - encounters his lover, the Marchesa del Poggio, Kelbar’s niece, who is scheduled to marry a man merely to spite the Cavaliere for neglecting her. The plot is full of nonsense, but it moves swiftly – there were cuts – and it goes down as easily as an Italian cream pastry. The success is due, of course, to the assembled forces. Scenic designer Stephen Dobay created a basic set with variations for all three productions. In “Un giorno,” it morphed seamlessly from breakfast room to bath (for the Marchesa) to bedroom (for Giulietta) to garden and to salon. A giant faux-marble frame at that back of the stage showed an ominous castle in the distance. (Whose castle it was remained unstated – it could hardly be the Polish castle of King Stanislaus, since the opera is set in Brest, France, on the coast of Brittany. Remember, the original play was French.) Costume designer Amanda Mujica created totally apt, occasionally witty, outfits in all three productions. And lighting designer Christopher Ostrom showed subtlety in deftly highlighting soloists during their asides from the frequent ensembles. Stage director Joshua Major directed his actors to perfection. Thanks to Major, who was also responsible for the delightful production of Rossini’s “La Gazzetta,” a North American premiere, put on by the New England Conservatory last year, the cast moved like dancers and their actions went beyond the stock poses and attitudes typical of opera buffa productions. One example: As the Marchesa emerges from her bath in the second act and is squeezed into her corset by the bevy of maids at her service, she hits her high note as they pull the cords to their greatest and most painful extent. One came to believe that these were real characters with real feelings, despite the frequent absurdity of the plot. And that is an achievement not to be undervalued. In the pit, music director Gil Rose, known for his devotion to modern and contemporary music, was in the buffo zone from the dynamic Rossinian overture. And the chorus, playing the huge team of servants – the Barone must have been quite rich – was superb both musically and dramatically. The cast was extraordinary, well matched and balanced. They sang and acted together as if they were members of a long-established company rather than a group of free agents brought together for a single production. That is due to their own fine instincts as singers and actors, but also to the efforts of Major and Rose to fuse them into a real comic ensemble. As Belfiore, the false king of the title, Michael Chioldi, who sang regularly at the New York City Opera, possessed a strong and rich baritone, and if he acted a little pompously in his absurd cardboard crown and sash that was because the role called for it. Still, he gave me chills at the opera’s conclusion when in full resonant voice he proclaimed himself to the Cavaliere di Belfiore, not the King of Poland. One of the delights of the evening was to watch baritones James Maddalena and David Kravitz, two local singers, as the Barone di Kelbar and his Treasurer, plot and scheme and come to grief as their plans were undermined by the smarter and more nimble youngsters – with the crucial help of Belfiore, the false King. Maddalena’s voice is a glorious ruin at this stage of his long career, but he used it to dramatic advantage as the blustery Barone. Kravitz, a superb singing actor, possesses a mobile face and he executed comic double takes with aplomb more than once. The success of their pair of patter duets was based on their clear and precise enunciation of the Italian text as well as their acting rapport. The two female singers helped raise the tonal palette from the baritonal. As the Marchesa, soprano Amy Shoremount-Obra was sassy and outraged by her shabby treatment from her so-called lover, Belfiore, passing as the King of Poland. Vocally, she was terrific in the first act aria “Ah! Non m’hanno ingannata” (Ah! They have not deceived me), which ends with the spirited cavatina, “Grave a core inamorato” (It is bad to restrain the ardor of a lover’s heart), which has been often sung by bel canto specialists like Montserrat Caballe. But she hit her peak in the second act when in an extended aria she expressed moods that ranged from coyness to anger with vocal brilliance. As Giulietta, the classic ingenue, mezzo-soprano Jessica Medoff, acted with great comic timing, but her voice tended toward the metallic and was forced at times. Still, she put the role over with apparent ease and visible enjoyment. And she was particularly good in the short aria in which she says she wants a young husband (Edoardo) not an old one (his uncle La Rocca). And who would dispute her feelings? And then we come to tenor Yeghishe Manucharyan, who sang the role of Edoardo, the penniless nephew of the greedy La Rocca, who is in love with Giulietta. Manucharyan has a light pleasant tenor voice, never forced or hooty. But like so many of his vocal types, he tended to be something of a stick when it came to acting. Dramatically, it was difficult to believe that the spirited Giulietta would want such a cipher, even if he were young. At the end, the two marriages that were being prepared at the opera’s start go forward, only with different pairs of couples. As was typical in the pre-feminist texts of 19th century Italian opera, the girls, who are smarter than the boys, get their ways. In both cases, the women marry the men they love, not the men they expected to marry. All things considered, it was an enchanting production of an unfairly neglected opera that audibly delighted the opening night audience. But it was only the first of Odyssey Opera’s maiden voyage into staged productions. The next night, Rose presented two one-act operas from the end of the century and the start of the new. Well, although both are staged and sung by actors with an orchestra, neither was originally presented by their composers as operas, probably because of their length. (Both are less than 50 minutes long.) Mascagni, who, despite a large and diverse output, has been fated to be remembered for only one work, his verismo masterpiece, “La Cavalleria Rusticana,” called “Zanetto,” which premiered in 1896 in Pesaro, Italy, a scena lirica, a lyric scene. Wolf-Ferrari called his comedy “Il segreto di Susanna,” which was premiered in 1909 in Munich, an intermezzo. Whatever that meant in his mind, it is like the Mascagni work with which it shares a program, in practical terms, a one-act opera. “Zanetto” is a fascinating experiment in late 19th century decadence. A hothouse perfume seems to emanate from its sultry tones. 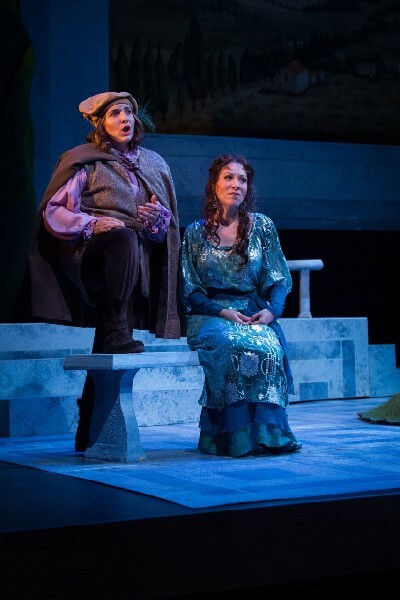 The story, which is set just outside Renaissance Florence – a view of the Tuscan landscape fills the over-sized frame that dominated the set in “Un giorno di regno” - is simple: A wandering troubadour, Zanetto, encounters a jaded courtesan, Silvia. Young and impetuous, he falls in love with her. Already despairing about her loveless and lonely future, she sends him on his way. The work is essentially a dialogue between innocent love and love embittered by experience. There are some lovely moments. Before he enters, Zanetto is heard singing, accompanied by harp, what a late 19th century composer re-imagines a madrigal to be. And Silvia, as a verismo heroine, has ample opportunity to voice the deep passions a woman of her state feels. And at the end, when Zanetto is sent on his way, he asks for the flower in her hair to remember her by. Silvia gives it to him, singing that by the time it wilts he will have forgotten her. But on the stage it never came to life. At the start, the acappella chorus in the orchestra pit, was off-pitch, curdling what should have been a dream-like experience into something unpleasant. Both soprano Eleni Calenos as Silvia and mezzo-soprano Eve Gigliotti as Zanetto sang well enough, although Calenos, who brought the full passion to her singing the role required, could be shrieky as she hit her high notes. But there was no chemistry between them, and Gigliotti, who possessed rich, chocolaty low notes, was totally unconvincing as a young wanderer with a lute slung over his shoulder. Did they not get enough rehearsal time? Or was it just a more existential matter? Fortunately, the evening came to a rousing conclusion with Wolf-Ferrari’s timely romp of a comedy made timely again by changing social morés. Set in early 20th century Piedmont, Italy’s most progressive region, “Il Segreto di Susanna” features a cloistered wife and a controlling husband. He returns home after having sighted her – or at least a woman who resembles her – walking on the city streets, an occupation he has forbidden. (See: the gender politics we deplore today in Muslim countries was common only 100 years ago in the West.) But more disturbing to him is what he smells when he gets home: the acrid scent of a cigarette! He immediately jumps to the conclusion that she has been entertaining a man, either at home or somewhere his smoking habit has clung to her garments. After much hilarity - and this dated comedy is quite funny – he finds out that his wife’s secret is not that she has a lover but that she smokes! The opera ends with them reconciled, lighting up a pair of cigarettes together. Composed at a time when women smoking was controversial – remember the Camels ad with a soigné woman saying to her man, “Blow some my way” – it makes sense again now when smoking is so déclassé and banned in so many homes. The Odyssey production set the scene in a period home, complete with a poster for Massenet’s “Cendrillon” on the back wall – are they telling us something about future programming?? – but it could probably more profitably have been set in the present. A cursory look at YouTube shows that recent productions elsewhere have taken that approach. Whatever approach they took, as I said before, the opera was a laugh-fest, reminiscent of a good “I Love Lucy” episode. (Were there any bad “I Love Lucy” episodes?) Of course, in addition to director Daniel Gidron, who also directed “Zanetto,” the cast of two singing actors and a silent butler was largely responsible for the fun. Inna Dukach as Susanna and Kristopher Irmiter as Count Gil were gifted comic actors both vocally and physically. Dukach’s soprano was light and flexible, a little forced at the top of her range, but she excelled in “O gioia la nube leggera,” an homage to cigarette smoke, certainly the only aria addressed to such as theme in the opera literature. Irmiter’s bass-baritone was rich in tone, powerful and expressive. He specializes in such heavy roles as Scarpia in “Tosca” and Wagner’s Dutchman, so it was great to hear him apply his big voice to a lighter role. He sang here in Odyssey Opera’s inaugural concert of “Rienzi.” It would be great to hear him here again. And a perhaps silent word should go to Steven Goldstein as the silent butler Santé. Short with slicked back hair, he was a silent conspirator with his boss Susanna, taking snorts of snuff when she lighted up. It’s the kind of character that makes you suspect all kinds of depravities going on in his private rooms when no one is looking. Although he didn’t sing, he helped make the evening the fun that it was.